Lifelites, an organisation that provides assisted technology for severely disabled children, has been presented with £5,000 by the local Freemasons for use at Children’s Hospice South West. 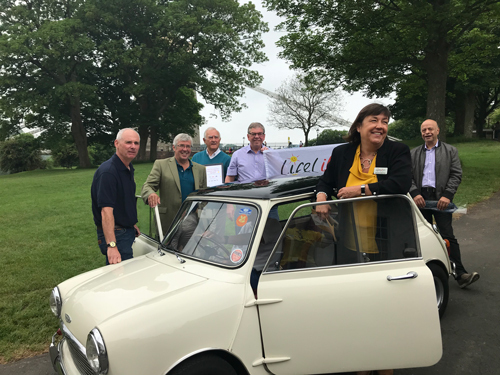 The presentation was made to Simone Enefer-Doy, the CEO of Lifelites who was being driven around the country in classic cars visiting various Masonic Provinces to raise funds. The assisted technology gives life-limited and disabled children opportunities that they might not otherwise have to play, be creative, control something for themselves and communicate. Lifelites also provides training and technical support free of charge. The cost of this over a four year life span is in the region of £50,000. Lifelites has been supporting Children’s Hospice SW at Wraxall since it opened in 2007. From Lifelites iPads with special apps, Eyegaze which allows a child to control a computer using just the movement of their eyes, to the Magic Carpet which projects moving images onto the floor, wheelchair tray or bed, that children can actually play with such as kicking leaves or popping bubbles.